I received this from the publisher for an honest review. I really liked The Edge of Falling and my heart just kind of hurts a little bit to think about Caggie's story. Her little sister drowns and she really blames herself because she should have been watching her. The grief really tears at Caggie and her family causing Caggie to really pull away from everyone -- including her (SO PERFECT) boyfriend. Then Caggie becomes thrust into the spotlight because she allegedly saves a girl from committing suicide and she is deemed as a hero. But there's more to the story and that's not exactly what happened on the rooftop and it eats away at Caggie. So when we meet Caggie we see this intense pain within her from these events and we know she is hurting and we see these signs that she's really having a hard time dealing with it -- the withdrawal from people and then hanging out with this kind of bad boy who has his own problems. Caggie was hard to connect with a lot of the time until closer to the end, where I feel the story really picked up, but I just could feel the weight of everything just weighing her down and the fact that she wasn't dealing with it. ASTOR. I didn't know whether we were supposed to like him or not but I DID NOT. I kept feeling very nervous for her with Astor around. I got the allure for Caggie in her present state of mind-- he didn't care about talking about their past and so she didn't have to think about things or confront them -- but he was bad news for me. You could tell he had his own issues and together they were just going to implode. The reveal didn't really surprise me at all but I think hearing Caggie finally say it out loud did affect me. I just felt very emotional towards the end and MAN was that quite the dramatic ending. The second half of the book was definitely my favorite because things REALLY start to come to the surface. It's hard to watch Caggie really go down a path that's not so great and you just really start rooting for her to snap out of it and confront the grief and the rooftop incident before she spirals out of control. You just keep waiting for that moment that you KNOW has to happen. The build up to that moment just really kept me reading. Bottom line: The Edge of Falling was a solid read that was emotional and really made me feel the weight of Caggie's grief and pain. It really become quite gripping about half way through and that's where I felt I become way more invested to Caggie's story despite her pain just dripping from the pages from the start. 1. If you could describe The Edge of Falling in 3 words, what would they be? 2. 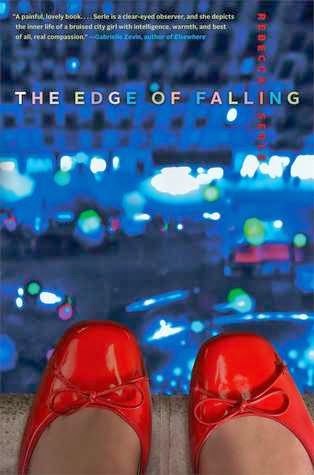 What is the most important relationship in The Edge of Falling? Wow, what a great question. The Edge of Falling is a book about relationships—the one Caggie has with her mother, her brother, her father, her ex boyfriend, her best friend—and the hot new guy at school. But I think the most important relationship in The Edge of Falling is the one Caggie is trying to protect, let go of, forget, and simultaneously keep forever: her relationship with her little sister who has passed away. It is only in coming to terms with that tragedy, and its aftermath, that Caggie can move on to begin to love herself. 3. What is your favorite section of the book? The climax. I can’t say too much about it because it would give a lot away (and I hope you’ll read it!) but it’s a very intense scene. Caggie is finally admitting out loud what really happened on that rooftop last spring when she supposedly saved a girl’s life, and even though we’ve had hints of it, this is when she really confesses. It was a challenging scene to write, and it’s one I’m really proud of. 4. Describe your writing process for aspiring readers. Well, first it must be exactly 68 degrees in my apartment and I must have a skim latte made exactly seven minutes prior and there must be no noise, whatsoever, and only direct light overhead…KIDDING. I’m not very precious about my process. Seriously, if you want to do this as a job, you can’t be. I write on the fly, when I can, how I can—that is how my books get written. But when I have a new idea I’ll do something that I think will be helpful for you to know. I sit down and “write my way in.” This means I free write for about 30 pages. Just whatever comes. The characters, the universe, whatever. After those 30 pages I sit back and look at what I have. It’s then that I determine what the story I want to tell really is. Interesting, especially when the author wrote about 'free-writing' her way into a story! I loved this book!! So glad to see that you did too!